Amazon.com description: Product Description: An artist associated with the New York School of poets, Joe Brainard (1942-1994) was a wonderful writer whose one-of-a-kind autobiographical work I Remember ("a completely original book" -Edmund White) has had a wide and growing influence. It is joined in this major new retrospective with many other pieces that for the first time present the full range of Brainard's writing in all its deadpan wit, madcap inventiveness, self-revealing frankness, and generosity of spirit. 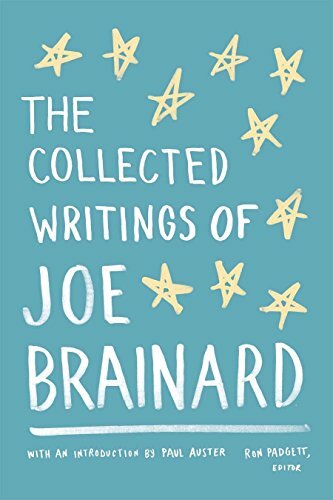 The Collected Writings of Joe Brainard gathers intimate journals, jottings, stories, one-liners, comic strips, mini-essays, and short plays, many of them available until now only as expensive rarities, if at all. "Brainard disarms us with the seemingly tossed- off, spontaneous nature of his writing and his stubborn refusal to accede to the pieties of self-importance," writes Paul Auster in the introduction to this collection. "These little works . . . are not really about anything so much as what it means to be young, that hopeful, anarchic time when all horizons are open to us and the future appears to be without limits." Assembled by the author's longtime friend and biographer Ron Padgett and including fourteen previously unpublished works, here is a fresh and affordable way to rediscover a unique American artist. About: An artist associated with the New York School of poets, Joe Brainard (1942-1994) was a wonderful writer whose one-of-a-kind autobiographical work I Remember ("a completely original book" -Edmund White) has had a wide and growing influence. With Dina Alarcon | from Casa Bautista of Pubns (May 1, 1991); titled "Los Valores Cristianos En El Hogar: Christian Values in the Home"